Please add all travel, meals and lodging expenses. For airline travel, I use JFK out of New York City. I do not own a car and will need a car service to get to the train station or airport. Requests: A private home is a great alternative to a hotel, non-smoking please. I love animals. Vegetarian foods, please. Email me with questions, to schedule an event or to request a class specific to your group’s needs. I am now also offering online workshops! Throw away any preconceived ideas of what you can and cannot do with beads, sequins, embroidery thread, found objects and lovely bits. 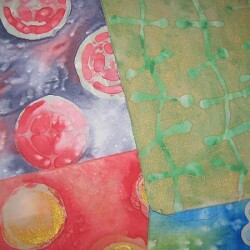 We will use anything and everything to push your quilt art to the next level, to create an additional surface! 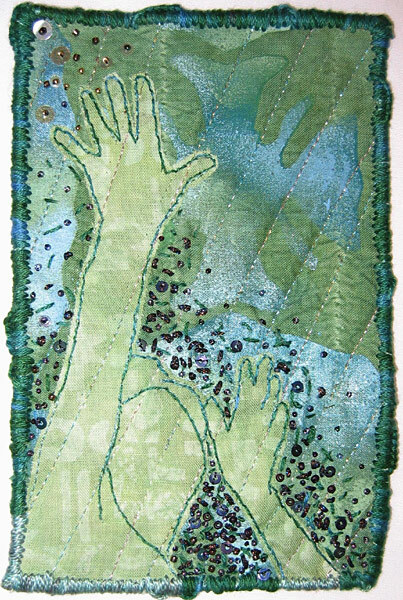 Bring workshop pieces, quilts you would like to add another dimension to, or create a piece specifically to embellish in class. Let’s go wild! 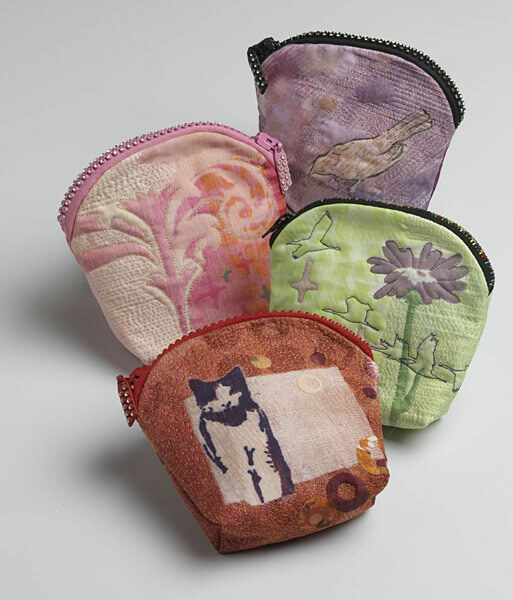 A pattern is supplied as we explore the techniques used to create these one of a kind purses. 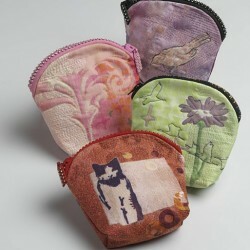 Techniques covered include machine embroidery, bobbin drawing, thread painting and embellishment. Basic sewing skills including the ability to set a zipper helpful. 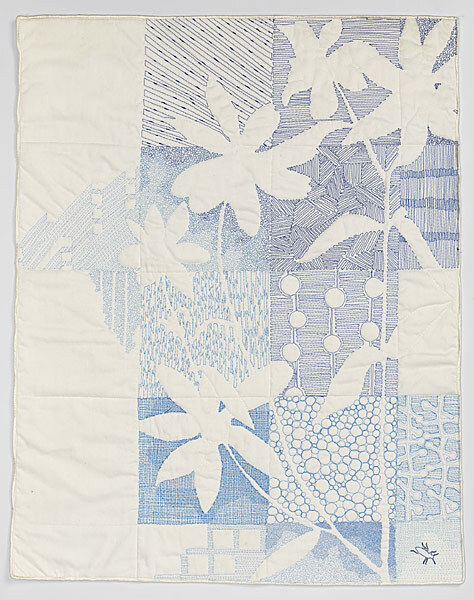 Working both on paper and cloth we will explore what marks can be made on paper and then interpreted on a quilt sandwich with your sewing machine. Innovative supports, like masking tape, tracing paper will be explored in depth. 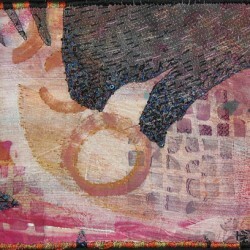 Artistic Imagery, in the medium of quilt art, need not be large in order to have a big impact. Working in a format 4×6 inches, we will explore collage techniques, reverse machine appliqué and machine embroidery to enhance your artistic explorations. If needed, a pattern is available. 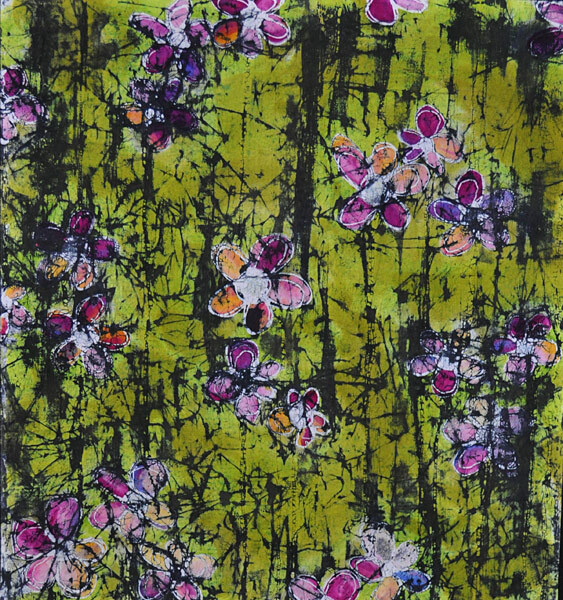 We will use the soy wax to create batik like effects on cloth-texture, line and beautiful bits of trapped and resisted color are central to this medium. 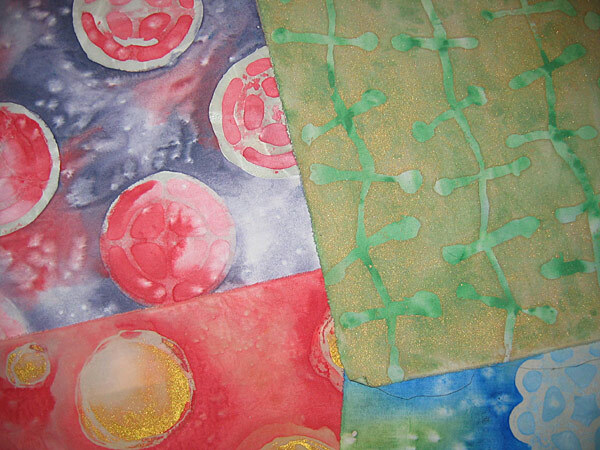 When using soy wax with monoprinting in thickened Procion MX dyes, the possibilities grow exponentially. Soy wax, an ecologically safe, food grade wax, unlike paraffin it can be washed safely and completely out of cloth in your home washing machine, no harsh chemicals are needed! 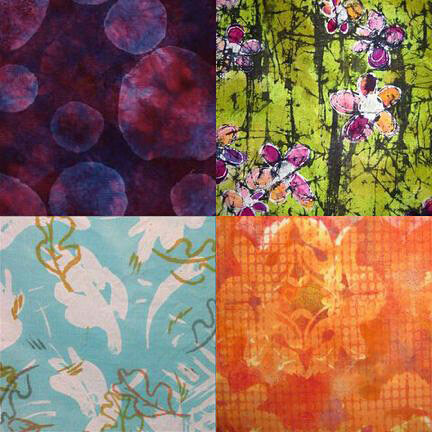 Soy Wax gives batik a whole new name! 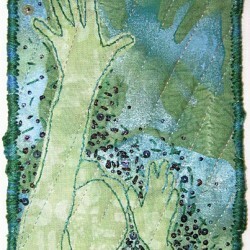 It’s a resist that is an ecologically safe medium-it’s green! 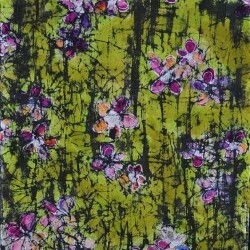 Combine it with paints to create highly textural and unique fabrics with dynamism and depth. 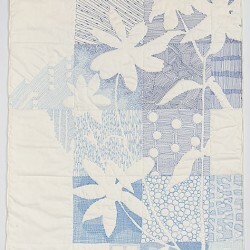 This is a highly addictive way to create pattern on cloth and think of the possible uses in your mixed media art and quilts! 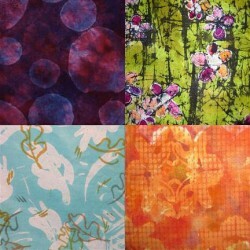 Create unique, vibrant fabrics! 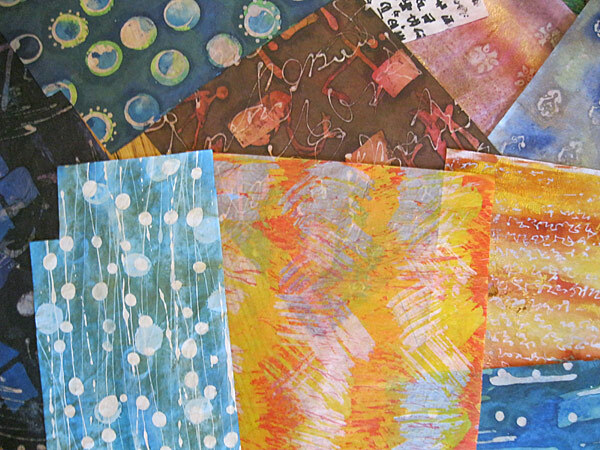 Batik techniques are no longer tied to petroleum based waxes or fabric, soy wax opens the doors to an environmentally friendly approach to resisting and creating your own papers! 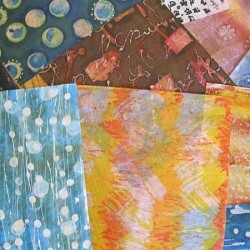 This class explores what papers work best and why, pairing papers to the correct paint, design and composition. 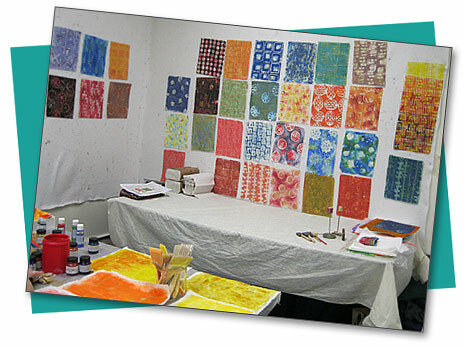 Freezer paper, soy wax, and thickened Procion MX dye on cloth present the quilt artist with a wealth of possibility and a rainbow of color and texture. We will explore design, composition and combining these media to express yourself and your artistic vision in a playful and easily approachable manner. Follow the progression of my artistic pursuits through a presentation of slides and humor. 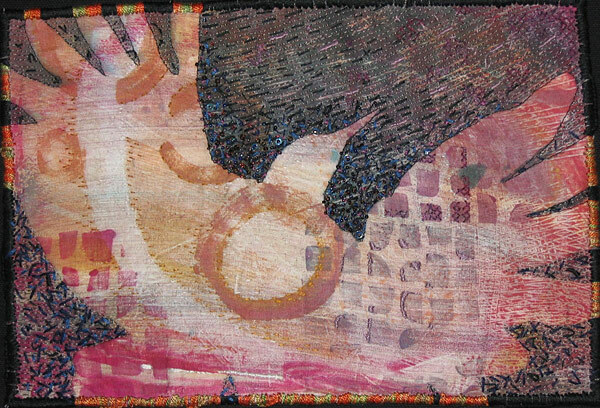 This lecture will explain my inspiration and approach to making quilt art, designing fabrics and embellishment.